The BBC programme Something Understood of November 25, 2018, featured my translation of Vivaldi’s Autumn sonnet. Here is a listening link, where it will be available online until around the end of December 2018. The exact portion of the reading of the sonnet is between 3:34 and 4:11. Notes (c) 2016 Christopher DiMatteo. All rights reserved. 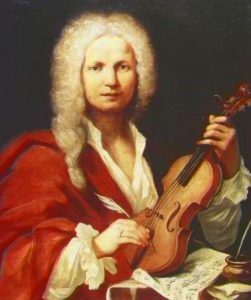 Antonio Vivaldi (1678-1741) in an anonymous portrait of 1723, in the Museo della Musica, Bologna. The Four Seasons are part of a collection of twelve concertos entitled, “Il Cimento dell’Armonia e dell’Inventione.” Cimento means “Challenge,” “Contest” or “Test of Skill” which is an appropriately ambitious title. 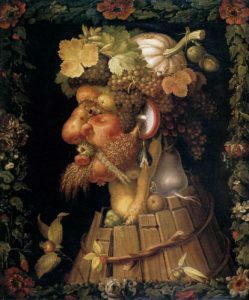 There are four sonnets that go with each of the concertos of the Four Seasons, which lay out the program in the music. My translations of all four of the sonnets are on their own page on this site. As with all the Four Seasons, the music of the Autumn concerto follows the story in the sonnet quite closely. 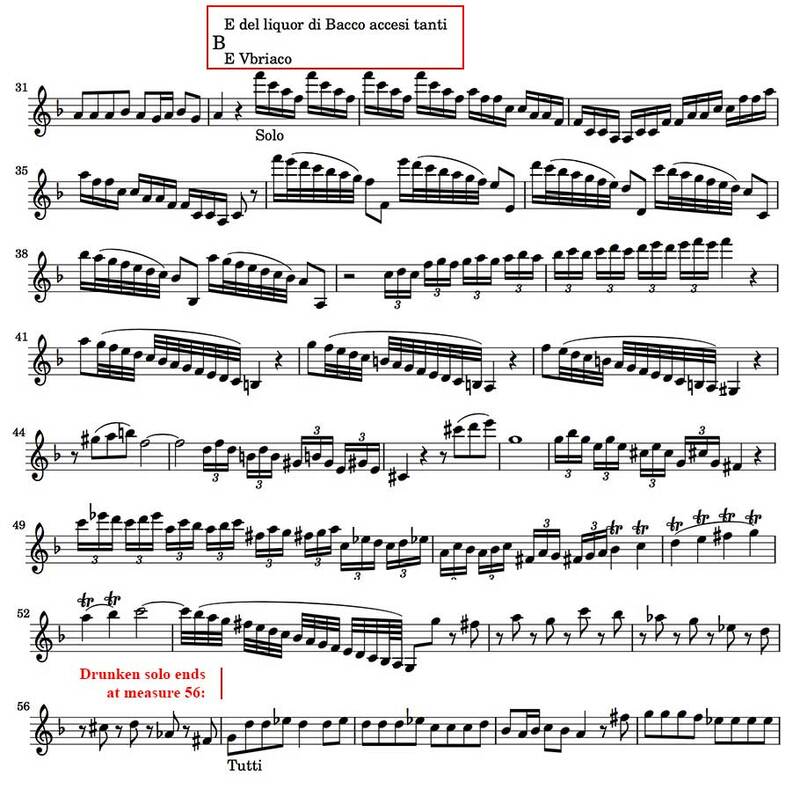 After the Villanelle dance is introduced in the first movement, the rest of the movement is a technical display for the solo violinist (all of the section at letter B, below) where the notes depict the drunken revelry of the country people, ending with them falling asleep (letter C). The whole second movement is a prolonged, peaceful nap (letter D). The third movement tells the story of a hunt, in two voices. First, the whole orchestra plays the hunting motif, representing the hunters. Then, the solo violin part narrates the hunt from the point of view of the hunted animal. 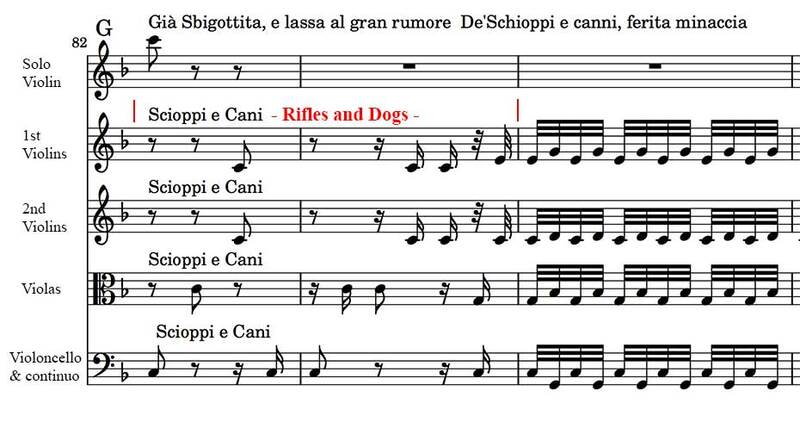 At letter G, measures 82 and 83, notice how quiet and subtle is the musical depiction of rifles firing and dogs barking, across all four sections of the string orchestra (at 1:42 – 1:44 in the audio track below). The hunt motif comes back again and again, and the solo part becomes more and more frantic and technically challenging as it tells the story of the fleeing animal and its eventual capture and demise. This listening guide shows the Autumn sonnet, with the original Italian lines in blue, my translations right below them, followed by bits of the score showing the musical themes that illustrate each section of the sonnet. First, here is my translation of the complete sonnet, then the listening guide. To peaceful sleep and fine enjoyment. But weakened by fleeing, it struggles and dies. Translation (c) 2016 Christopher DiMatteo. All rights reserved. Vivaldi’s’ works are in the public domain. Scores from www.MutopiaProject.org. Licensed under the Creative Commons Attribution-ShareAlike 3.0 (Unported) License. The image of Vivaldi is an anonymous portrait in the public domain and is held in the Museo della Musica in Bologna. The image of Arcimboldo’s Autumn is also in public domain, the work is in the Musée du Louvre in Paris. The recordings are by Neville Mariner and the Academy of S. Martin in the Fields, they may not be copied and are here presented under fair use.